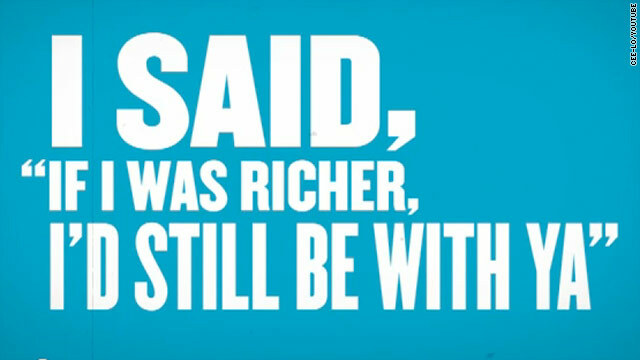 The simple video for Cee Lo's new song, a viral hit on the web, just features its lyrics on a screen. Cee Lo also has recorded a sanitized version of the song, "Forget You!" (CNN) -- The soul and hip-hop singer Cee Lo Green has a penchant for beautiful music with a dark subtext. In 2006, as half of Gnarls Barkley, his angelic voice sounded a little unhinged on the huge hit "Crazy." The song's surreal video had Cee Lo and partner Danger Mouse appearing within blurry ink smudges like a moving, threatening Rorschach test. The clip was watched by 5 million YouTubers. Now Cee Lo is back with a new song that is just as melodic and nutty -- although in its current form, not quite as radio-ready. Its title is "F**k You! ", which also happens to be its chorus, and it's an angry kiss-off toward a lover who has left for a richer man. During the chorus, the expletive rolls off Cee Lo's tongue like he's saying grace, but the lyrics are instantly relatable to anyone who's been scorned: "I guess he's an Xbox and I'm more Atari, but the way you play your game ain't fair." And people will remember the lyrics, because that's all the video is -- a bunch of words flashing on the screen. "F**k You!" mixes up the text size and occasionally changes background colors. Beyond that, however, it's basically just video karaoke -- a bold choice considering any controversy over the song was sure to be about its words. According to a New York Times article, the no-frills video was rushed out as a placeholder before a more elaborate clip could be created. The video garnered more than 3 million views in the past week -- a big number considering the song has gotten no radio play. The tune also was No. 26 Monday on iTunes' top-selling songs list. Watch the video and try not to sing along by the time the second chorus hits, especially with those "ooh, ooh, ooh"s that sound like some outtake from the '50s soul group biopic "The Five Heartbeats". Cee Lo's video is already spawning imitations, most notably an homage (parody?) remix by hip-hop bad boy 50 Cent. Cee Lo also has recorded a sanitized version of the song, "Forget You!" which has been played on the radio in England but not in the U.S., according to the Times. Something tells me that version, if and when it hits the web, won't be nearly so popular.